Liz: Today we’ve got a guest post from our old high-altitude-ballooning friend Dave Akerman (just as well, really, because I’ve got really bad backache and am having to make a little nest of pillows to sit in before I can type without wincing). Tomorrow morning, Eben and I are rising with the lark to drive over to Berkshire, where we’ll be “helping” Dave launch another Pi-enabled balloon. This time, the payload is someone who may look familiar to you, and he’s going to try to replicate a world record. This is cross-posted from Dave’s own blog, where you’ll also find much more information about tracking this flight from home if you’d like to follow us along tomorrow. 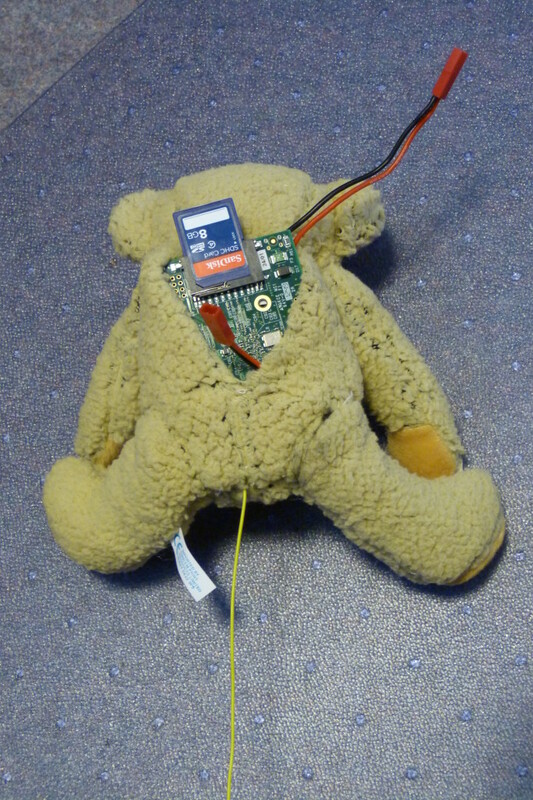 We selected Babbage as the Raspberry Pi bear (you can buy your own Babbage here) because as well as being cute and cuddly, he’s just the right size to fit a Pi inside. I’ll let Dave explain what he did once he’d scooped Babbage’s innards out (I had an email in which Dave described those innards as “the right stuffing”), and why. Thanks Dave! My next flight is an attempt to reproduce Felix Baumgartner’s record-breaking skydive as part of the Red Bull Stratos project, albeit on a slightly smaller scale. So whilst this project won’t be manned (just beared), and doesn’t have the same sort of budget, it does aim to exceed Felix’s flight in one regard – altitude – albeit by a mere 31 metres. So here we have a model A Raspberry Pi (sans almost all of the connectors), GPS receiver, batteries and a radio transmitter. Only item missing here is an aerial which was added later. The next pic is near the end of the procedure, with the aerial protruding from the logical place. Note the picture of the star constellation that Babbage’s capsule is named after! The mission is now planned for Saturday 24th August. Babbage will be tied to the capsule using nylon cord running through a device that will release him at 39,000 metres, when he will descend with his own parachute. Both Babbage and Ursa Major will take and transmit photographs throughout the flight, except for two periods. The first is when they reach an altitude of 38km, when they will both take videos for 8 minutes (plenty enough time to reach 39km when Babbage will drop). They will also switch to video for their landings. Fingers crossed that it all goes well! Looks interesting, good luck tomorrow. Does Babbage not need an oxygen mask? Presumably this has to be the new world record for cutest HAB payload? That actually made me groan audibly. Well done. Make that the cutest HAB payload with his eyes hacked out and an unfortunate tapeworm problem. As the wind predictions stand at the moment, we’re expecting him to land about ten miles from the launch site, if we launch early enough in the day. The key words there are “at the moment”. Yes the launch vehicle will keep going up (now it a bit faster without the baggage of Babbage) with the balloon bursting a few minutes later. The landing position should be pretty close to Babbage’s. Could this be the world’s first Supersonic Bear? Have to say, though; I like the idea of a sonic bear boom. 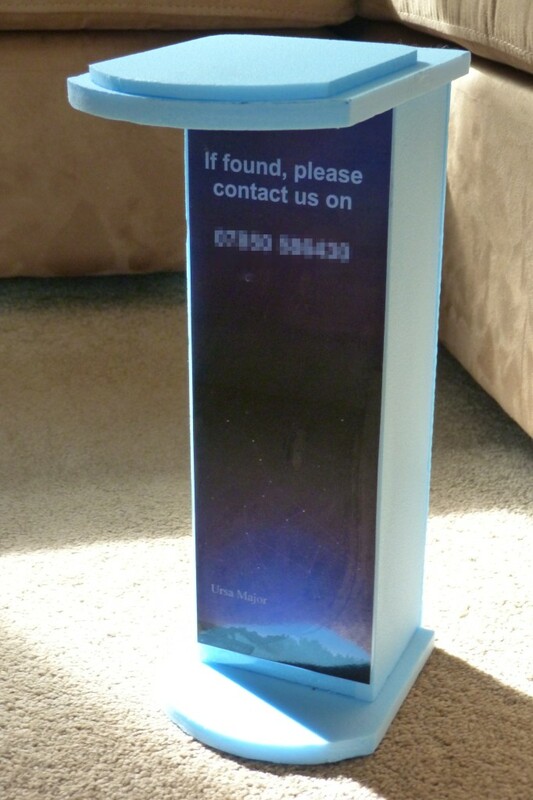 Don’t forget anything tomorrow morning: just make sure you leave for the launch with all the “bear necessities” packed…! Ted Bull already beaten Red Bull. Good Luck, particularly with the weather. Just don’t look at the yellow cable in-between his legs on the 2nd picture. I can’t bear the wait. Good luck with the launch. …to boldly go where no bear has gone before! I will be listening and decoding, hope everything goes well … the weather does not look too brilliant for Saturday – lots of rain. 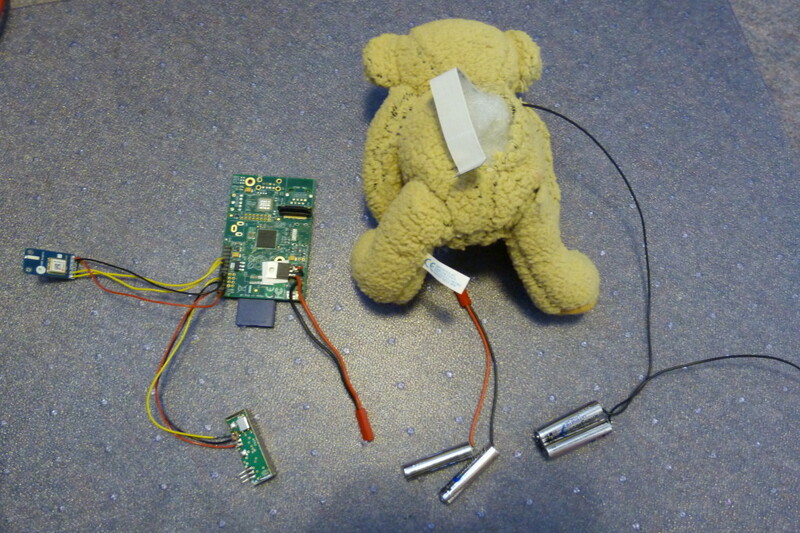 I recalled the description of the internal temperature probe in the book as I gazed at Ted with that yellow wire emerging from his err “fundament”….. The right stuff or the right stuffing? oh no ted bull has no live stream or wel? Just had a quick look how high airplanes go: ~12000m. So our bear is three times as high! Thinking about this dangerous mission has the kettle-and-snare drum music from “The Six Million Dollar Man” opening running through my head… if all does well, our little “Borg Bear” (LoCUTEus) will be just fine. My best wishes and hopes for this scientific endeavor. is this going to be an issue for you guys? I just hope Babbage’s Famous Last Words aren’t, “My God, it’s full of stars … ” or we may never see him again, other than as a Space Cub in a bubble looking over all of us down here! Try for a Babbage in orbit first – I think. Then shoot for the moon. It would be cool, but going to the edge of space is a little different than going to the moon. It would be nice to fly a big balloon to the moon, but sadly I don’t think it’s going to happen =D. Dave — how does the release mechanism work? There’s a resistor holding the harness – it’ll burn out at 39km. When it sees 39km altitude, it puts about 5 watts through a 1/4 watt resistor, melting the supporting nylon cord. I can’t bear to live on this planet anymore. I’ve been watching this on and off throughout the day and really enjoyed following the route on spacenear.us and the cam on batc.tv (hilarious chat too!) – The highlight for me was switching between the live feed from the chase car and the pics from Babbage – In my head I had the theme from the sweeney during the car sections and Bowie’s space oddity for Babbage – an unusual but entertaining remix! Fujikura , soon you will be defeated!!! So, is Ted Frame 93 (dark and fuzzy) Babbage/Ted lying in someone’s back yard, a bog, or some other random location selected by Murphy for its ground-level inaccessibility and high-angle radio horizon visible only to the NSA’s and GCHQ’s assets? Thanks John! 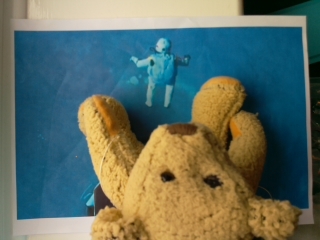 I’ll have a bit more in the way of pics and explanation of what went on (and what went wrong – poor old Babbage’s release mechanism didn’t work so he was the bear who fell to earth still in his capsule) on Monday. The great news is that this project, even with the failed release mechanism, saw Dave get yet ANOTHER world record for highest live transmission of images from an amateur device. Did Ted make it 39000, the graph looked a bit short of that ? Looks like a release !! I guess we saw on the live tracker updates only every-so-often, but the onboard release mechanism has realtime altitude from GPS. So maybe it did reach the target height, even though the telemetry didn’t happen to transmit at the actual release point? Or was there a secondary logic condition for release, once the rate of climb has dropped below some minimum? I gather both vehicles were recovered, so presumably the onboard logs will have finer-grained data. Yes, TED appeared to get stuck for a while just below 39000, whilst the balloon was still rising to 41000, and then decended. Interested to know what actually happened to TEDs altitude. Well I recall that both cameras were set to record video of the release itself, during which time I guess stills were not taken, and perhaps that interrupted other processes. Yes the release was triggered (in the main payload – PIE) at 39km, as planned. Some issues on TED which I’m looking into now. Looks like the SD card was jarred during the start of the jump, but that’s not confirmed. That was a neat video of the release taken from PIE. I’m guessing the peak G-forces were several seconds after release, as the parachute opens and the cords yank the bear around (were they very stretchy?) Maybe at least a few recoverable frames were recorded to the SD card? BTW my daughter (5) saw some of the telemetry still frames, before going to school. She looked a bit worried and said “Is that somebody’s teddy bear?” I had to assure her the bear would be OK. I did think when I saw the SD card sticking out of his shoulder blades that a micro SD card might be snugger and more secure (whether it’s in a bear or not! )… think we have an adapter knocking about here if you want to experiment. Yes, that would help. 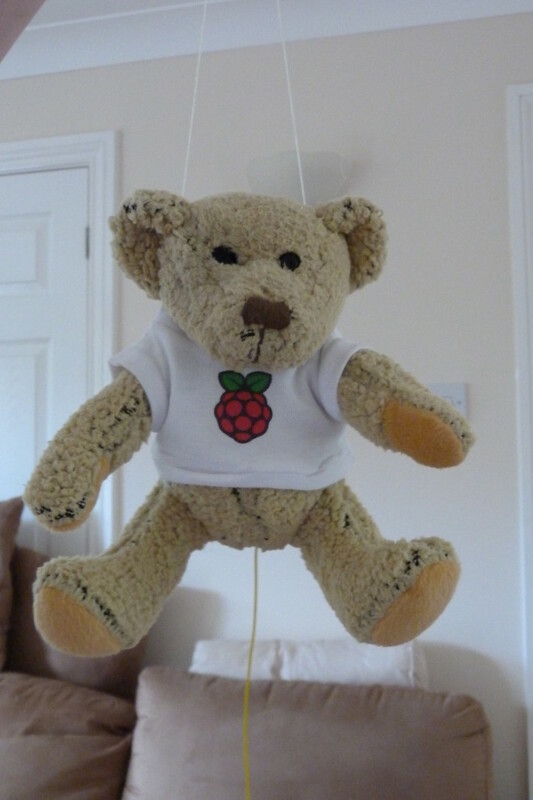 It’s the first time I’ve had such problems in a HAB but of course the bear isn’t an ideal container for the Pi! I wonder if the SD card could be glued into place. Hot-melt glue can be easily removed with a hot-air gun if needed. If this doesn’t get kids interested in the Pi and STEM, nothing will! Way to go Team TED: Babbage, Pie, Dave, and the rest of the gang! What is the ladies altitude record? Can’t a girl bear be a hero too? Babbage needs an Ada to help him with the programming. He does, at that. We’re looking into it. Out of curiosity, on what band was the transmitter operating on?